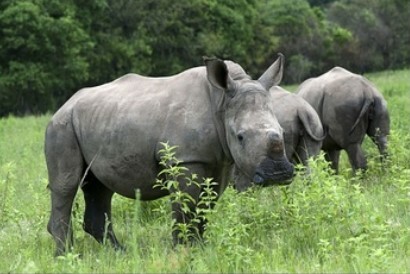 Baby Rhino Tank at Baby Rhino Rescue | Adopt and Donate Now! Tank came to Care for Wild Africa in March 2014 when his mother was poached. He was ten months old. When he arrived, he was in a state ofconfusion and shock and all he wanted to do was eat and sleep. He has settled down beautifully into his new life and is a favorite with the volunteers who call him "a machine." When the volunteers have to choose a rhino to feed, they all want to feed Tank. He is a boisterous, happy acrobat. He could climb a fence if he chose to. He often puts his front legs onto the night pen doors when he is being fed. Tank was a little too energetic at first, but he quietened down considerably after being introduced to Satara. Satara is Tank’s best friend. They are always together. When they have eaten and want to lie in the sun, you will always find them side by side. Tank is very friendly to all the volunteers. He will be the first one to come and say hello when volunteers approach their enclosure.